What was your favorite aspect of the M.A. in English program? The most positive aspect of my experience has been the professional and compassionate way in which every professor has instructed their courses. They challenge their students while providing foundational knowledge and practice, which establishes an environment in which students can succeed with the material and the personal value it imparts. 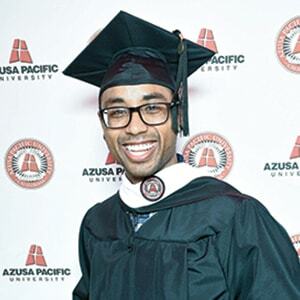 Were there any other benefits to completing your master’s in English at APU? I discovered the M.A. in English program during my senior year as an APU undergraduate and learned about the 4+1 B.A./M.A. option. It allowed me to take M.A. courses as an undergraduate and get acclimated to the rigor of graduate study while accumulating credits toward the master’s degree. This opportunity gave me a head start on earning my graduate degree.